Low End Mac is taking a long weekend, so we're posting this week's news roundups on Thursday morning. This week's big news is the first Mac malware in the wild. We've been essentially malware free for over 7 years, but now it's time to think about malware scanning software. On the Linux front, openSUSE 11 is getting rave reviews. The only drawback we've run into is that there isn't a CD-based installer, and our Linux testbed 400 MHz iMac only has a CD-ROM drive. Which Old Macs Will Be Left Behind by Snow Leopard? PR: SecureMac has discovered multiple variants of a new Trojan horse in the wild that affects Mac OS X 10.4 and 10.5. The Trojan horse is currently being distributed from a hacker website, where discussion has taken place on distributing the Trojan horse through iChat and Limewire. President Nicholas Raba stated, "The increased number of threats, security advisories, and security updates is an indication that Mac users must pay attention to computer security issues. As Apple's market share continues to grow, so will security research and hack attempts against OS X." The Trojan horse runs hidden on the system, and allows a malicious user complete remote access to the system, can transmit system and user passwords, and can avoid detection by opening ports in the firewall and turning off system logging. Additionally, the AppleScript.THT Trojan horse can log keystrokes, take pictures with the built-in Apple iSight camera, take screenshots, and turn on file sharing. The Trojan horse exploits a recently discovered vulnerability with the Apple Remote Desktop Agent, which allows it to run as root. The Trojan is distributed as either a compiled AppleScript, called ASthtv05 (60 KB in size), or as an application bundle called AStht_v06 (3.1 MB in size). The user must download and open the Trojan horse in order to become infected. Once the Trojan horse is running, it will move itself into the /Library/Caches/ folder, and add itself to the System Login Items. Protection: To protect your system against this threat, run MacScan 2.5.2 (MacScan is a product of SecureMac) with the latest Spyware Definitions update (2008011), dated June 19th, 2008. SecureMac recommends that users download files only from trusted sources and sites. MacScan quickly detects, isolates, and removes spyware from Macintosh computers using both real-time spyware definition updating and unique detection methods. The software also manages Internet-related clutter on your computer. It is designed for OS X 10.2.4 and later, and is compatible with OS X 10.5 Leopard. MacScan sells for $29.99 for a single user license, $49.99 for a family license. "Computers are one of the most trouble-prone products Consumer Reports tracks in its annual product-reliability surveys. When it came to solving problems, wait time on the phone and the knowledge of support staff, Apple's tech support received high scores across the board for both laptop and desktop systems in Consumer Reports' latest survey featured in the June issue." "Is that a dongle in your PC, or are you just happy to be using OS X? "For as long as Mac devotees have been flaunting desktop superiority over their Windows counterparts, users on both sides of the fence have clamored for a way to install Mac OS X on a PC. On Monday, the wait may be over. "Dubbed 'the best solution for running Mac OS X on PCs' and consisting of a device that is 'neither a memory stick nor a thumb drive,' EFiX allows non-Mac users 'to install Mac OS X straight from the original DVD without having to worry about patches, replacing files and anything like that' is poised to free the PC world from the shackles of Vista. "Unfortunately, you won't find one in any US store. But the idea is intriguing nonetheless." "Apple's Leopard operating system isn't even a year old, but its offspring, Snow Leopard, is already preparing to prowl. "But would Apple pull the plug on upgrades to its older Macs less than two years after completing the transition of all its computers to Intel processors? Probably not, said Tim Bajarin, president of Creative Strategies. "...Richard Doherty, an analyst with the Envisioneering Group, suggested there could be a Snow Leopard 'lite' that would lack some features available to those using Intel Macs." Link: Could Old Macs Be Left Behind by New Operating System? "The people who bought PowerPC Macs, particularly the high end Power Mac G5 bought the machines with an expectation of being on the cutting edge for several years. Was this perception wishful thinking or had past OS revisions indicated that Apple kept the machines it sold compatible with the latest version of the OS for a good long time? Time for a look at how long it has historically taken Macs to become obsolete. Going through every model would not be repetitive and not very enlightening. It is more informative to look at the OS releases and see what Macs were left out. The place to start is at the beginning and the first OS to leave a Mac out of the game was System 7...."
"As if Grand Central weren't enough bad news for Microsoft, now they have ZFS to contend with. Building a reliable, high-performance file system takes years and Microsoft doesn't have years to respond. "The formal announcement is for Snow Leopard server, which is how Apple introduces new file systems. HFS+ first arrived on a server version as well. "Anyone who stores data should." "2008 is proving to be a banner year for Linux distributions; so far we've seen Ubuntu 8.04 and Fedora 9, both of which go a long way toward making Linux painless for newbies. "The most noticeable thing when you start up openSUSE is the new installer which is just about the slickest setup app this side of Mac OS X. The easy-to-follow installer will walk you through everything with a level of handholding even Ubuntu can't match. Note that if you opt for the DVD installer you'll have the option to install all three desktops, while if you opt for the GNOME only distro you won't see the new installer." "The decades-long Mac versus PC battle recalls those video games in which the Big Boss Bad Guy just can't seem to squash our nimble little hero. "Clever marketing and product development vie against massive market share. And with each round, the question grows: Is there a reason to switch to Apple, and is now the time? "This year the ABA Journal is letting some real advocates argue the case. Ben Stevens and Rick Georges are not only lawyers using opposing systems; they are proponents who advise on the use of technology in the law office. "They have strong opinions, and they're not afraid to state them. No games, no rules and no punches pulled." "I've had an aluminum keyboard since just after its launch, and I generally love it. However, what annoys me was that it easily misses some keystrokes, specially the 1/! key on my keyboard. "Today I decided to take a look at the key, and now I have it working much better...."
PR: This wireless card gets your PowerMac on the net wirelessly, freeing you from the necessity of running cables all over your home or small office. At an extreme 54 Mbps, you have all the bandwidth you need for downloading, sharing or printing large files. Works with any computer that can run OS X 10.2.6 or later and has an available PCI slot - including computers that cannot take Apple's 802.11g AirPort Extreme card. For Internet access, an access point and Internet connection are both required, or you can connect at your local hotspot. AirPort card must be removed for compatibility. Not compatible with Dual-core PowerMac G5s. No software installation. These 11g PCI Cards work with the AirPort software built into your computer. 54 Mbps maximum performance up to 150 feet. 64-bit and 128-bit hardware-based WEP encryption. Designed to utilize Apple's AirPort drivers and software that is included with OS X 10.2.6 and later - no software to install. Supports AppleTalk, TCP/IP, & other network protocols. Works with Apple AirPort Base Stations including Extreme and Express, WiFi compliant Base Stations and other 802.11b/g Access Points. IEEE 802.11b/g WiFi Compliant. FCC Part 15 & CE compliant. Apple AirPort compatible including support for AirPort Password, WPA mode, & AirPort Extreme. 11g PCI Card rev. A: Requires Mac OS 10.2.6 (10.2.8 recommended) or later and Airport Drivers v. 3.1 or later. 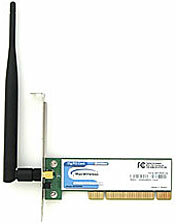 11g PCI Card: Requires Mac OS 10.3.3 or later and AirPort Drivers v. 4.2 or later. Both Cards are compatible with OS 10.5 (Leopard). AirPort card must be removed for compatibility. Strongly recommend using the free software update feature (in 10.2.x - Apple menu > System Preferences > Software Update, in OS X 10.3.x, 10.4.x, and 10.5.x - Apple menu > Software Update) to acquire the latest version of your operating system before installation. Power Macintosh G3s: Beige, Blue & White, All-in-one. 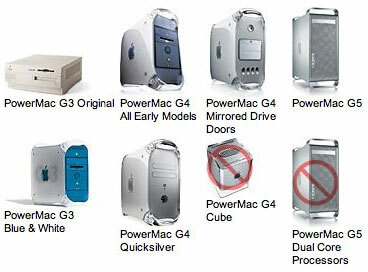 Power Macintosh G4s: All Except G4 Cube. Power Macintosh G5s: All except dual-core G5s. Dual-core G5s were produced after September 2005 and have PCI Express slots which are not compatible with traditional PCI cards. If you have a dual-core G5, we recommend our 11n USB Stick or 11g USB Stick. AirPort card must be removed for compatibility with all Mac models. Not compatible with Mac Pros, MacBooks and MacBook Pros.